Port Campbell is a coastal town in Victoria, Australia. The town is on the Great Ocean Road, west of the Twelve Apostles, in the Shire of Corangamite. At the, Port Campbell had a population of 599.HistoryThe town was settled in the 1870s, with the first wharf being built in 1880. Port Campbell Post Office opened on 19 March 1874. It was renamed Port Campbell West in 1881 when a new Port Campbell office opened near the wharf. At the 2001 census, Port Campbell had a population of 372. At the, Port Campbell had a population of 599. 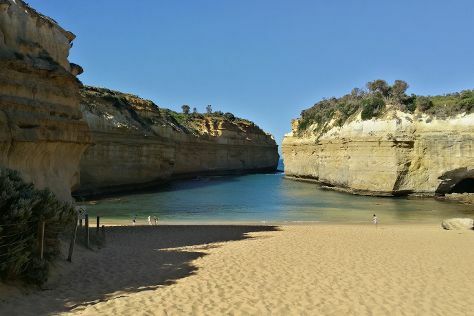 At the, Port Campbell had a population of 618.Port Campbell is now a popular tourist destination for visiting The Twelve Apostles, located 12 kilometres to the east of the town and the Port Campbell National Park, as well as maintaining a small crayfishing community. Port Campbell is in Victoria. Plan your visit to Port Campbell and other destinations in Australia using our Australia trip itinerary tool .